One of my favourite benefits of homeschooling is the travel opportunities that it brings! Before we had kids, we were big travelers and loved exploring new places and experiencing new cultures. However, we dramatically cut back our travelling time once we started building our family. This was due to finances and just the general inconvenience of travelling with children. However, we took our first whole family vacation when our youngest Sammy was just one month old! 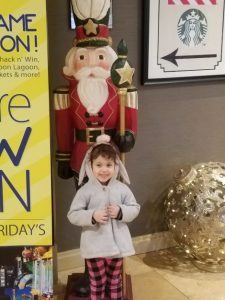 We celebrated his Mirthday at the Americana Hotel and Water Park in Niagara Falls. Now, Niagara Falls is less than 45 minutes from us, but we figured a little getaway for a couple of nights would be good for us. And it sure was! 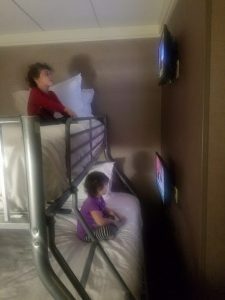 The kids loved it and became obsessed with hotel life. We’ve taken a few trips since then, and found ourselves back in Niagara Falls (albeit the US side) almost a year later, to celebrate little Sammy’s first birthday! Travelling with small children sure changes the way you travel. It’s different, but we are so lucky that our littles seem to have been bitten by the travel bug and really don’t complain during long car rides (we haven’t attempted any other form of travel yet). Dropping down to a single family income and having more people to feed does but a strain on the budget, but we are making travel a priority. One way to take some of the financial pressure off of travelling is by travelling cheap and smart. This means, taking advantage of the amenities in the hotel room (microwave and min fridge) and taking advantage of deal sites. Typically I book hotels through hotels.com or .ca (depending on the exchange rate and which sites have the better deals). I find their prices are pretty much the same as all of the other travel booking sites, but with every 10 nights you book with them, you get a free night for a later trip! I double up on the savings by using my favourite cash back site, Ebates (.com or .ca) to reduce my costs even more. However, when it comes to Niagara Falls, a digital travel agent isn’t always the best option. This is simply because the hotels themselves often put out promotional deals that can include not only the hotel stay, but also food vouchers, attraction passes, shopping coupons and all sorts of other discounts. You can sometimes find these prepacked deals on the hotels’ websites, but also on deal sites like Groupon and Wagjag. One day I received an email from Ebates that they were offering bonus cash back on purchases through Wagjag, so I decided to pop over and see if there were any deals for products or services that we would use. 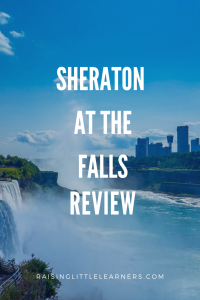 As I was scrolling through a number of deals came up for hotel packages in Niagara Falls, and after a bit of research on availability dates, costs and promotional inclusions, I decided we should take advantage of the Sheraton Niagara Falls, New York package – and upgrade to a Family Suite. Check in was a nightmare. Plain and simple. We checked in on December 26th, so it is quite understandable if they were not fully staffed, but there seemed to be a lot of chaos and just lack of procedure. I waited in line for about 20 minutes to check in. This was simply due to the huge amount of people waiting to talk to one of the two front desk people. While this was a little frustrating, it wasn’t the end of the world and I could understand the reason for it. However, once I got to the front was when things started to go downhill. The agent at the front desk was very kind and even though he was undoubtedly overwhelmed by the sheer volume of people and the chaos, he stayed calm and professional. It was just before 5pm when I checked in and check in time was 3pm. He informed me that my room was not ready, but that they would notify housekeeping to get right to work on it and then contact me. While this was frustrating, it really wasn’t a big deal, so I left my number, went and collected my husband and kids from the car and brought them in to explore the hotel while we waited. Fortunately, there was lots to look at. Being the day after Christmas, there were still lots of decorations up and around the lobby. The kids enjoyed the lights and reflected on our holiday celebrations. And still we waited. We wandered down to the pool area, where the kids watched others swim, looked at the fish tank and followed the sharks. And still we waited. We wandered down to the spa, and the kids looked at another gorgeous fish tank and the cool lights. And still we waited. We sat on some nice couches and they played on our phones. And still we waited. We went to Starbucks and grabbed some drinks and snacks. And still we waited. We wandered down to the arcade and the kids checked out the video games. And still we waited. We went into the Rainforest Cafe gift shop and the kids marveled at the animals. And still we waited. After about an hour, we went to TGI Fridays and put our name on the wait list. And still we waited. We went back to the lounge in front of Starbucks and the kids played on devices some more. And still we waited. As we neared the two hour wait mark, and the kids were losing their minds, I headed over to the front desk to see if there was an update. Miraculously (can you read the sarcasm there), at that exact moment, a notification came up that our room had just been finished. How convenient. Nevertheless, I went about checking in, at which point the front desk person apologized for the wait and made the mistake of asking how my day was going. So, I told him. I told him how hard it was to manage 3 kids 5 and under who desperately wanted to go up to the hotel room and also go swimming. I told him how frustrating it was that we were told our wait for a table would be 20 minutes, some 40 minutes prior. I was always kind, because I knew it was not his fault, but I was honest. He was quite gracious and went over to his manager and explained what happened. Then he came back and offered me a $20 credit for one of the two restaurants on the property. I appreciated the gesture, especially since it seemed like a genuine attempt to apologize and make things right. Then he started entering my info into the computer. He looked up at me slightly perplexed and asked if I had received my voucher package yet. I told him that i had not. He asked me to wait a moment and went back over to his manager. The manager studied the screen and then asked where my package was from and what it included. Turns out that the computer was indicating that I should get a free pay-per-view movie. This no longer exists at the hotel. At this point, I was completely defeated from all of the extra energy that was required simply to get up to our room. As an overtired mom, dealing with overtired, excited young children after all the chaos of the holidays, I almost started to cry. Seriously. But I held it together, and listed off the parts of the deal I could remember. Then offered to go back to where my family was (not so) patiently waiting to get the paperwork I was told I wouldn’t need. Fortunately, they told me not to worry and had an idea of what was included. Then they went about making me a package with the vouchers that were supposed to be included, along with a few extra goodies. I really appreciated the extra effort and the fact that they tried to make the experience right, with a few extras and just general kindness and sincere apologies. I’m so pleased that we went with the upgrade! The room was absolutely fantastic! I seriously regret not taking pictures of the whole space, because it truly was a perfect fit for us. It was an extra $50 USD/night, but totally worth it! The layout of the space was fantastic. When we first walked in, there was a little hallway with a long sofa table against the wall. This was so handy for a dump station, where we would just leave coats and shoes and various other paraphernalia that needed somewhere to go. A few steps down the hallway space took us into the living room, where there was a pull-out sofa, two chairs with a little table, a TV mounted to the wall with a fridge/microwave set up on stand underneath. There was a small dividing wall that extended part way out and behind it was a set of bunk beds, with TVs mounted on the wall for each bunk. For a three year old and a five year old, this was the best thing ever! A few steps from the end of the bunk beds, was a desk and chair, giving yet another place to stick stuff. Just past the microwave/fridge set up, was a door that led into a bedroom with a closet, en-suite bathroom, and TV on top of a dresser. We had the option of choosing a King Size bed or 2 Queens for that room, which is great for really big groups. This was by far the best hotel room we’ve ever stayed in as a family, and we will certainly miss that set-up when we go back to normal hotel rooms next time we travel. The hotel itself was beautifully organized and full of amenities. There was a really cool pool area that had a big fish tank and a small shark tank with 2 baby sharks in it. The water was really warm, and the temperature in the room was also very warm. This was absolutely fantastic for us, as we didn’t have to rush once the kids were out of the pool and also didn’t have to worry about them getting too cold. There were also two large hot tubs off to the side of the pool, but unfortunately, they were adults only. If your kids can be independent in the pool, they also have a huge sitting area filled with plastic chairs and tables, and many loungers around the perimeter of the pool. Our kids are still little, so we have to be in the water with them, but a great option for those who don’t have to be. While we loved the pool, the one thing we didn’t love was the behaviour of some of the other guest. Unfortunately, it seemed as though many parents enjoyed the sitting area so much, that they completely ignored the chaos and danger that their kids were putting both themselves and others in. This was of course no fault of the hotel, but a very unfortunate part of our experience. The arcade area is pretty cool. Nathaniel’s just getting into video games, so he had an absolute blast! While we were there, it was pretty crowded, which caused a bit of anxiety for me and trying to keep track of my three little kids, but it was still a pretty good set up. There were multiple games to choose from and the kids loved the flashing lights and pushing buttons! Part of our package included pre-loaded game cards to use to play the games with. We received two $10 cards for each night we were there (so we ended up with four), which was pretty awesome. The hotel is quite smart in that the balances from each card cannot be transferred and the tokens won, are stored digitally in the card, so there is no transferring of prize tokens between cards. Fortunately, our littles are little enough to just be excited about getting a price and didn’t care what it was! During our stay we had the chance to eat at the Starbucks, the Rainforest Cafe and TGI Fridays on site. Starbucks is Starbucks and pretty much the same no matter where you go, but the other two locations were definitely not great. 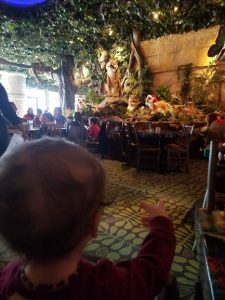 The food at the Rainforest Cafe was terrible and over priced. We kind of figured this would be the case, so we weren’t overly disappointed and went in with the attitude that we were paying for the experience. The baby was absolutely terrified each time the thunder storm went off, but some cuddles and reassurance calmed him down. The other two absolutely loved it though. They couldn’t have cared less about the quality (or price) of the food, and just soaked in the atmosphere and watched the animatronic animals in awe. We also went at an off peak time, which gave the kids some freedom to explore the restaurant and really watch everything. So, while the food was terrible, the experience and wonder was well worth it. I’m really not familiar with TGI Fridays. It’s not a franchise we tend to visit when we’re in the US, so I’m not sure if the food quality is the same across the board. It certainly wasn’t terrible, but it wasn’t the greatest either. Since we had such a long wait to check in and because it was getting late, we decided on TGI Fridays for dinner the first night we were there. 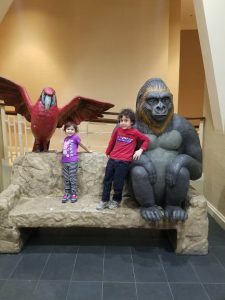 We knew that the Rainforest Cafe was going to be expensive and we didn’t have our vouchers yet, plus the kids were grumpy and we really wanted them to experience and enjoy the atmosphere, so we went with TGI Fridays. When we went down to get a table, we were told it would be about a twenty minute wait, which was fine. We left our phone number so they could text us, and headed back upstairs to the lounge area so the kids could relax on the sofas or move around in the more open space. At this point we had been waiting about 2 hours. So I decided to get an update from the hotel about our room and was finally able to check in. I mentioned the wait to the front desk manager, who was kind enough to give us a $20 gift certificate to use at the restaurant on top of all the other bonuses. After we were check in, we wandered back to TGI Fridays to get an update on our table and the hostess quickly found space for us. It was loud and busy, which was actually kind of convenient since the kids were so done at that point. We ate our okay enough food, and before the bill came, I slipped upstairs to our room since the baby wasn’t having anymore of the highchair. While up there, Dan paid the bill and the waitress gave him grief over trying to use the gift certificate along with the coupon that came with our hotel package. Fortunately, after years of couponing, he has learned the difference and to read the fine print. It was honoured, but nevertheless was an extra nuisance on an already stressful evening. So we decided to pick up some groceries and stock our mini fridge for the rest of our meals. Was super easy and much nicer to just let the kids eat in the hotel room. As many mix-ups and issues that we had, we were constantly met by warm and friendly employees. Everyone from the cleaning staff, to maintenance, to the front desk were all very friendly, welcoming and happy to say hello to our super excited kids. We were so very pleased with the customer service that we didn’t feel as bothered by the mishaps as we might have otherwise been. The hotel, staff and facilities are great. It is a wonderful place for a family to visit and getaway. With so much to do, there’s really no need to even leave the building, which is pretty convenient. That being said, we were quite content heading to Wegmans to pick up some fresh fruit, veggies and other foods to eat in our room. While we don’t mind splurging on restaurants when we are away, we definitely feel the lack of fruits and veggies quite quickly, and frankly, the restaurants really weren’t good enough to eat at more than once. I paid for the hotel room upgrade in cash at the hotel to avoid any exchange and processing fees from my credit card company. Unfortunately, at bill processing time, the person in charge forgot to release the hold they put on my card for the upgrade and I was charged for it. It is over a month after the fact and I have still been unable to connect with the billing department to get my money back. This is quite frustrating and has seriously decreased the likelihood of us returning. The other mishaps were all manageable and honestly, not problematic enough for us not to come back (because of the great atmosphere and customer service), but not having phone calls or my overcharge returned has stopped us from considering coming back. 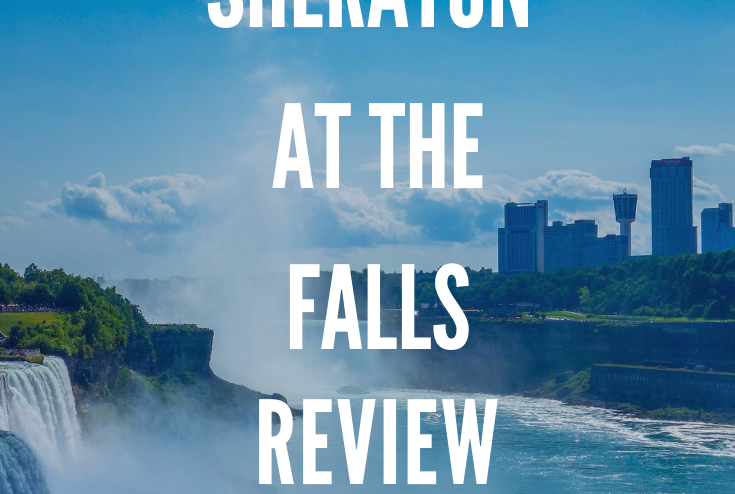 Have you stayed at the Sheraton Niagara Falls, NY? How was your stay?